What do you do after Halloween has come and gone, the costumes are put away, the kids have come down from their sugar high, and the jack-o-lantern is starting to wilt… and there are still pounds and pounds of candy all over the place? What do you do when the after-Halloween candy sales tempt you beyond your ability to resist? Send it all to the troops, of course! Our military men and women deployed around the world always enjoy candy in their care packages, and this is the perfect time of year for shipping chocolate–the cooler weather means it’s less likely to melt! Now is the time to plan how you will use Halloween to support the troops. Patriotic kids and parents can send extra Halloween candy to Soldiers’ Angels, who will make sure it brightens the day of a service member far from home (please be sure to send “the good stuff,”–no crushed/melted candy or broken/torn wrappers, etc.). 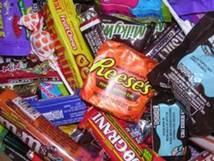 Stores also offer big discounts on their extra Halloween candy after the 31st, a great opportunity to stock up! Halloween is a great opportunity to get your school and community involved in gathering candy for deployed heroes.